They’re dark and covered in opaque clouds. These new findings are a result of a new study based on observations made with the Spitzer Space Telescope. Assistant astronomer Thomas Beatty of the University of Arizona, who led the new study, discussed the results at the 233rd meeting of the American Astronomical Society today (Jan 7). The theory helps address a curious trend — the nightside of every hot Jupiter discovered so far was found to be at 1,000 degrees Kelvin. These planets vary greatly in dayside temperatures, so the alignment of nightside temperatures is a mystery. In this study, the team used Spitzer to observe KELT-1b, a brown dwarf. Brown dwarfs are objects slightly larger than hot Jupiters, just big enough to contain some nuclear fusion, but not big enough to be stars. Despite this, they do look somewhat similar to hot Jupiters, making them ideal for a comparison. Because KELT-1b is much larger than most hot Jupiters, at 28 Jupiter-masses, the team expected its atmospheric dynamics to be drastically different. 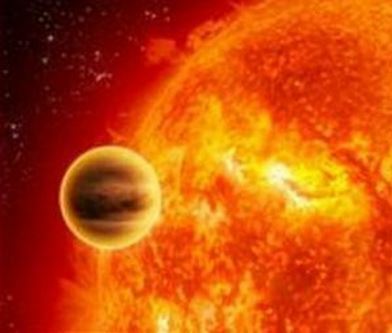 “What we actually found is that KELT-1b looks extremely similar to its skinnier, hot Jupiter, cousins, with a day/night temperature difference right on the hot Jupiter trend. This caused us to take a look at the underlying temperatures on all these planets,” Beatty said in an email. Shockingly, with Spitzer observations, they found that all discovered hot Jupiters (and KELT-1b) have a nightside temperature of just about 1,000K. It seems improbable that the temperatures on the dayside and nightside are able to balance out so well that the nightside of every single object in this category is at exactly 1,000K. “So, instead, we argue that clouds must be present in the nightsides to be causing all these planets to have the same observed temperatures,” Beatty added. How the clouds interact with the atmospheres of hot Jupiters is still largely unknown, but the researchers theorize that they’re helping to trap heat and keep temperatures uniform. I predict sometime down the road it will be found cloud cover has very little to do with the temperature anomaly, but what causes synchronous rotation does. What about the lapse rate? Just been involved (wasting breath) in another jackup against N and Z, ATE, at WUWT. At least Anthony let it run and restrained Willis’ arrogance. Doubtful they will think deeply about the Gas Laws etc., but at least our trojans had a good say.